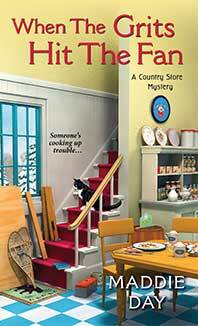 The Country Store Mysteries feature Robbie Jordan and Pans ‘N Pancakes, her country store restaurant in fictional South Lick, Indiana. Edith Maxwell writes this series as Maddie Day. In Strangled Eggs and Ham (June, 2019), while Robbie scrambles through breakfast orders South Lick, Indiana, tempers run as high as the sticky August heat. A developer’s plans to build a towering luxury resort at one of the most scenic hilltops in Brown County infuriates opponents, who concoct protests and road blockades. When tensions boil over and a vocal protester is silenced forever at the resort site, Robbie ditches the griddle to catch the killer. But if slashed tires are any indication, she’ll need to crack this case before her own aunt gets served something deadly next . . .
Death Over Easy released in July, 2018. Restaurateur Robbie Jordan is ready for the boost in business a local music festival brings to South Lick, Indiana, but the beloved event strikes a sour note when one of the musicians is murdered. Find downloadable book club discussion questions here: Death Over Easy Book Club Questions. Biscuits and Slashed Browns released in January, 2018. For country-store owner Robbie Jordan, the National Maple Syrup Festival is a sweet escape from late-winter in South Lick, Indiana—until murder saps the life out of the celebration. This fourth edition of the adventures of Robbie and her core crew in South Lick, Indiana was in the top forty bestselling books at Barnes and Noble for many weeks. When the Grits Hit the Fan released in March of 2017 in paperback and audio. Despite the bitter winter in South Lick, Indiana, business is still hot at Robbie Jordan’s restaurant. But when another murder rattles the small town, can Robbie defrost the motives of a cold-blooded killer? Edith was the guest on a slew of blogs as part of a Great Escapes Blog Tour in April. Here’s the schedule. Book Two, Grilled for Murder, is out in all formats, including audio. Robbie Jordan may have had reservations about the murder victim, but she still needs to turn up the heat on a killer if she wants to keep her new restaurant open for business. Country Store Mysteries Crossword Puzzle! What a terrific debut! This deliciously clever cozy–set in a deceptively charming little town–is fresh, intelligent and delightful. A winner! Day’s series debut provides some quirky characters and red herrings along with the … romantic interest and recipes. Setting rich in atmosphere… characters come alive in this refreshing, enjoyable mystery. You’ll flip for this mouth-watering new series… a tasty mystery with a side of scenic country charm… a delicious read. The rolling hills of southern Indiana never looked so inviting—or so dangerous.